Beaducation: The Blog: Lisa's new book is coming...So we are having a little contest! Comments are now closed! Lisa's new book is coming...So we are having a little contest! Comments are now closed! We are so proud! 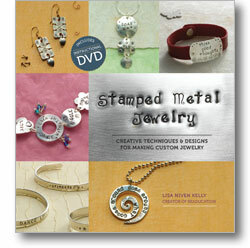 Lisa's new book was featured in the latest issue of Beading Daily. It's been a whole year in the making. It's full of cool projects... like this spiral pendant. And these stamped rings. 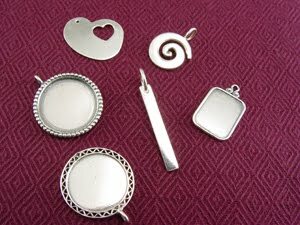 There is a whole bunch of great ideas for stamped jewelry! "Great," you say, "but what is the contest part???" Well, we have gathered a few of Lisa's very favorite blanks. (All Sterling Silver, all super cute!) To win these cuties, leave a note in the comments about what inspires you to make jewelry. Chat about whatever comes to mind. We'll love to hear what inspires you to create. Comments are now closed....thanks to all who entered! We'll let you know who won tomorrow. What insires me in my stamping is what surrounds me. I may see a flower, sunrise, child or even be reminded of a memory. Sayings come flooding back and I immortalize them in silver!!! It will stay alive through my work!!! The photos I take inspire me with their textures and color combinations and structures. I'm inspired to make jewelry because I want to see people share a bit of who they are. Stamping metal gives anyone an opportunity to say to the world, "Hey! This is what I'm all about." Whether you have no problem expressing yourself, or you hide in the comfort of your own world....I LOVE the expression and personality stamped jewelry can share. And if I can others involved....even better! Stamping is such fun, I'd love to win. My inspiration comes from my family and my faith. I think I am most inspired by quotes - then I get to figure out how to make a necklace work around the quote! I love mixing copper & silver together & occasionally throwing in some fun beads! I am inspired by my beautiful daughter, Caoimhe. Whether it is a ring, pendant, or bracelet, everything is made with her in mind. I try to imagine what she might like to wear when she is older, and use a lot of blues to compliment her pretty eyes. Each piece is lovingly placed in her jewelry box, to be opened at a later, special date. I am inspired by the power of language...silly I know but I believe in the power of the words we use and stamped jewelry, keychains, etc create something tangible for us that bears powerful words. I am inspired by colors and textures in nature, quotes, and I am inspired by whoever I am making the jewelry for by their personality and what they like. I've just started stamping - this book would be a great help! My kids inspire me ... I create pendants with inspirational quotes/words that I try to teach them to live by daily. And, my memories ... when I was a child, i would wake up to my dad playing the guitar and singing, you are my sunshine. Whenever I make up this necklace for others, I get a sentimental feeling inside. Can't wait to see your new book!!! My friends inspire me. When I look at them I see the colors of beads that I want to use to make them something. I think of phrases that I want to stamp for them. It never fails to thrill them. A few, I have noticed, have actually changed their color scheme because of the compliments they receive about their jewelry! I LOVE the feeling of a blank piece of metal sitting in front of me on my benchblock....Stamping on metal is a bit like doodling on paper. Hypnotic, meditative, sheer joy. Until I misspell a word!LOL! It's so fun to stamp a piece for a friend~~~choosing a word or phrase to inspire. 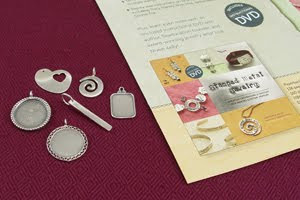 Choosing the designs that will complete your vision...stamping is my secret addiction! I'm inspired by the fact that I can create something that is uniquely me. Anything is possible. Whether it be making something for a special occasion, something to go with a specific outfit, or a unique gift for someone. The opportunities are endless! New to stamping ... but am inspired by the interface between life and words. Very powerful & grounding. Would love to learn from your booK! I really get inspired when I'm under pressure when I have to get it done right now! All those ideas that I procrastinated about finally come to fruition. Fashion inspires me -- I love clean looks and creating designs that feel custom-made to the wearer. Stamping certainly helps personalize jewelry! I'm inspired by my friends. Every one of them are going through different times in their lives. I tend to stop and create something that represents that stage or situation. I'm inspired by all my beads, crystals, pearsl, lampwork, wire and pmc, then playing with the components until the magic of a design awaits it assembly. I'm starting to incorporate stamped words - ah, hammer and metal - pure heaven! Can't wait for the book release. I am inpired by my family. Being a teenage girl, I dont have extra money to pay for supplies. But my friends and my family have encouraged me and am learning about what jewelry can mean to those who cant afford it and what it means to create a piece and give it to someone special. this book looks so great and helpful! Nothing inspires me like looking through my jewelry and feeling like I have "nothing to wear"! A surprising number of my favorite pieces are ones I've designed to wear with a certain outfit the night before an event. What inspires my jewelry-making is my all-consuming love for greyhounds :). My greys both inspire me and appear in my work in a million ways-from pawprints to goofy greyhoundisms, my hope is that my jewelry will bring great joy to the dog-parents who wear it, while raising money for animal welfare at the same time! I'm inspired by the color combinations in nature, as well as quotes. I am inspired by my family, faith, and the gratification in making something people love and treasure. My family inspires me. I want to make things that i am proud of and that they want to wear. I am new to this and am having so much fun. One of my inspirations for creating stamped jewelry is all of the wonderful folks I meet when competing with my dogs. I love to help them celebrate a milestone or awesome title by crafting something that will make the moment live on. I've also shed many a tear making a remembrance piece for a loved one who has left us. By making stamped jewelry I've made so many friends that I never would have met otherwise. I get inspired by people and their passions. A mothers love for a child, a mothers strength in her loss, a bosses ego not getting in the way of a project, a daughters pride in her homework, a grandmothers love of her creations. What inspires me are simple shapes in nature- I love leaves and droplets and even just circles or hearts -I find that these shapes lend themselves so beautifully to the words that I want to say with stamping. I'm inspired by the magic of words. A simple word or phrase can evoke powerful emotions. The colors and textures of nature inspire my jewelry making! Actually I find inspiration almost everywhere. My customers really inspire me, comming up with new ideas. Looking forward to the book! Also loved seeing you in Tucson! There's not enough hours in my day to accomplish all the jewelry that is swimming around in my head! My inspiration surrounds me every day through visions, words, dreams. What inspires me about stamping is being able to add a touch of someones heart to wear on the outside. Weather it's a loved ones name or something they want to world to know. I love the happiness they express when they receive their special stamped piece, makes me happy! Seeing new blanks inspires me...my life inspires me...what I see other people wear inspires me...everything around me!! My 16 month old is now the one that inspires me to make jewelry. I had put jewelry making aside for quite some time, but she has been ill her entire life and I started again to help me get through some difficult time. Tiny, as we call her is adorable and most would never there is anything wrong! I started my business and named it after her and soon got into stamping and order all of my blanks from Beaducation. I planned dissolve my business because of her medical needs, but it ended up leading me in a different direction. We thought she had cystic fibrosis for some time, so I began to make hand stamped jewelry to raise awareness and money for cystic fibrosis. While she does not have this terrible disease, I continue to make jewelry for it and hope to create more for other causes. In the meantime, we search for answers for my daughter and I make jewelry! She keeps me going and my jewelry helps keep her and my son close to my heart at all time. Sometimes I'm inspired by shapes in nature, architecture and rod iron. Other times it's my faith. And sometimes it's simply the undeniable desire to create. around me will put me in a mood to design a certain way. I love to create new things all the time, lots of one of a kind things. I am very excited about Lisa's new book as I am starting to get into stamping and coming up with different ways to incorporate it into my designs. I love making other people happy - inspiring them to look at what makes them happy and then being able to put that together for them. My favorite pieces are not the ones that people buy, but the ones that I make as little tokens of appreciation for other people who have made my life so full! It relaxes me, and I also love giving presents to my family and friends that I've made myself, so they are carrying a bit of my love and friendship around with them. I am a new stamper. I love to see others wearing their kids names or cute quotes...helps you get through a long day knowing your loved. Working in labor and delivery your patients share what their babies name will be, having your kidos name with you is special too. My children are my inspiration - every single day. I can't wait to stamp some of their adorable sayings on a pendant and wear it close to my heart every day! I am inspired by the need of creativity in my life. I feel like I want to create something, make something, affect something. With jewelry I can do this. There is no limit to what you can make. I was once told once that I create bits and pieces of happiness made of metal and rocks. And, in a time like this, it makes people happy to look at my work. Wow, I thought. I have been able to use my jewelry as a source of raising funds for some missionary work in Africa as well. This has certainly inspired me to want to make more as well! 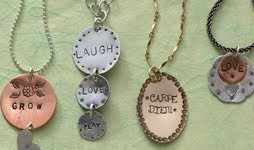 I love stamped jewelry because I love beautiful words. And wearing a meaningful quote on a pretty piece of jewelry is what inspires me. I love creating items that are meaningful to the people I care about -- for example, a stamped treble clef for my brother who plays the guitar, or a funky beaded necklace for my best friend in design school. I am inspired by the people I love! What inspires me mostly about stamping is words.Simply putting a word on metal and wearing it can bring a smile to your face or someone else's.I love to see people smile from the jewlery I have made. I am a funeral director and embalmer in the state of California. To say I have a lot of pressure on me to make things prefect at work is putting things lightly. Making jewelry gives me an opportunity go a little zen and release all the work restrains that I am put through. But while I am at work, and I am able to see families come together in a time of need; you can see how one person can touch so many people on their lives. It's like light, it is a constant in your life. You take it for granted but only when you are submerged in total darkness do you truly see the effect and benefits it provided you. That light or rather the reflection of light is what inspires me. Wow, what inspires me??? The love of creating! I mostly do altered art and collage work, and I found jewelry making a couple of months ago. I'm taking a class at my local college and finished my first piece, Monday! I can't wait to add some metal work into my altered art!!!! !